Cataract is a cloudiness of the eye’s natural lens. The most common form is age related cataract, which usually develops gradually over a period of years or decades. In Cameroon and Africa as a whole, cataract is one of the main causes of avoidable blindness and visual impairment. Patients with cataract may complain of excessive glare, poor color discrimination, blurred or smoky vision especially in strong light, and in some cases, total blindness in the affected eye. Some patients with cataract in West Africa have likened the reduced vision to the profound limitation of visibility caused by dusty weather during harmattan. 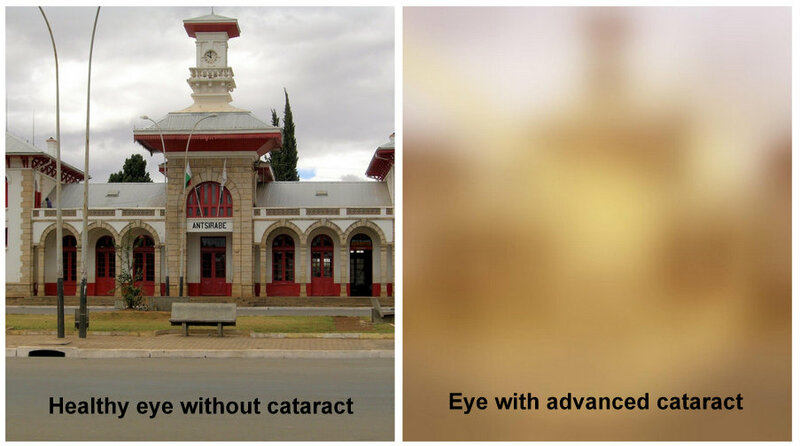 The photograph on the right simulates the type of vision a patient with advanced cataract could have, in contrast with that of a person with a healthy eye or an eye following cataract surgery (left). The only known treatment for cataract is surgery and loss of vision is generally reversible. If you think your vision has deteriorated, especially if you haven’t had a comprehensive eye exam for over 2-3 years, kindly consult your ophthalmologist. He will be able to determine if you have cataract, as well as screen for other potentially blinding eye disorders such as glaucoma and diabetic retinopathy. This entry was posted in Africa, Blindness, Cameroon, Cataract, Uncategorized and tagged blindness, Cameroon, cataract, Diabetic Retinopathy, glaucoma, harmattan, ophthalmologist, Simulation. Bookmark the permalink.